On September 11, 2001, a coordinated attack was carried out on the US. Commercial jetliners were hijacked and used as weapons, then crashed into the World Trade Center towers, and the Pentagon. 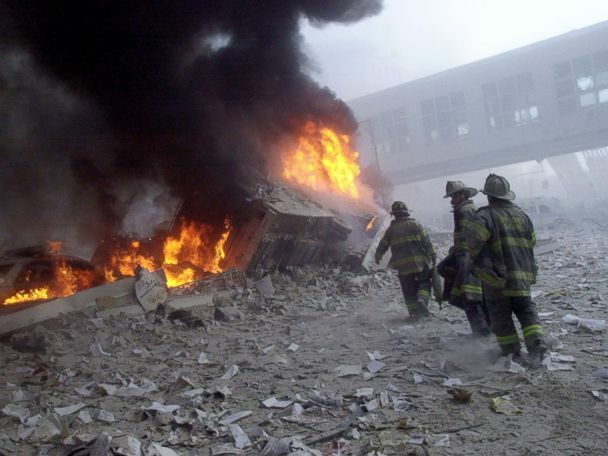 A fiery blasts rocks the World Trade Center after being hit by two planes on Sept. 11, 2001, in New York City. On September 11, 2001, a coordinated attack was carried out on the US. Commercial jetliners were hijacked and used as weapons, then crashed into the World Trade Center towers, and the Pentagon. </br></br>A fiery blasts rocks the World Trade Center after being hit by two planes on Sept. 11, 2001, in New York City. Smoke billows out from the Southwest E-ring of the Pentagon building, Sept. 11, 2001, in Arlington, Va., after a plane crashed into the building and set off a huge explosion. The South tower of the World Trade Center collapses on Sept. 11, 2001 in New York. People run from a cloud of dust and debris as one of the World Trade Center towers collapses on Sept. 11, 2001, in New York. People watch from Jersey City, N.J. as the second tower of New York's World Trade Center dissolves in a cloud of dust and debris about a half hour after the first twin tower collapsed, Sept. 11, 2001. FBI personnel continue excavating the site where United Flight 93 crashed, after the jet was hijacked during the 9/11 terrorist attacks, near Shanksville, Pa., Sept. 16, 2001.<br><br>United Flight 93 was one of the hijacked planes intended for use in the September 11, 2001 terror attacks on the World Trade Center in New York. Due to hero passengers and crew on board, the flight never made it to the intended target and crashed in Shanksville, Pennsylvania, killing all 44 on board including the hijackers. A New York fire fighter works amid the rubble of the World Trade Center following the Sept. 11, 2001 terror attacks in New York City. Police officer Mike Brennan helps a distraught woman covered in ash and debris seek shelter following the collapse of 1 World Trade Center in the aftermath of a terrorist attack, Sept. 11, 2001, in New York City. A bicyle sits covered with sediment and ash after the World Trade Center was hit by two planes, Sept. 11, 2001 in New York City. Marcy Borders is covered in dust as she takes refuge in an office building after one of the World Trade Center towers collapsed in New York on Sept. 11, 2001. An unidentified New York City firefighter walks away from Ground Zero after the collapse of the Twin Towers, Sept. 11, 2001, in New York City. The World Trade Center's Twin Towers and the Pentagon were attacked by terrorists using commercial airliners. Rescue crews engulfed in a fog of dust set about the task of finding survivors in the rubble of the World Trade Center, Sept. 11, 2001, in New York City, after a coordinated attack brought down the two towers. Capt. Michael Dugan hangs an American flag from a light pole in front of what is left of the World Trade Center after it was destroyed in a terrorist attack, Sept. 11, 2001, in New York City. The rubble of the World Trade Center smoulders following a terrorist attack on Sept. 11, 2001, in New York. FDNY firefighter, Dan Potter, pauses on a bench in Lower Manhattan after the collapse of the World Trade Center, Sept. 11, 2001. Firefighters raise a U.S. flag at the site of the World Trade Center after two hijacked commercial airliners were flown into the buildings, Sept. 11, 2001 in New York. Handwritten notes in memory of the victims of the terrorist attack on the World Trade Center on Sept. 11, 2001, are seen in New York City. A worker wipes his brow in the wreckage of the World Trade Center, Sept. 13, 2001, in New York City, two days after the twin towers were destroyed by two hijacked passenger jets. Dennis Diaz, a member of Local 100 of the SEIU, looks over the Wall of Prayers, Sept. 13, 2001, at the entrance to Bellevue Hospital in New York City, for members of the union who are missing after the deadly terrorist attack on the World Trade Center. A postcard pictured with the Twin Towers lies amid the rubble of the World Trade Center, demolished in a terrorist attack on Sept. 11, 2001, in New York City, Sept. 14, 2001. Every year since the attack the annual Tribute in Light has marked the anniversary of the terror attack on the World Trade Center towers in New York City on Sept. 11, 2001. The pillars of light represent both of the World Trade towers that collapsed after being struck by hijacked airplanes. </br></br>The annual World Trade tribute light is seen from Jersey City, New Jersey, Sept. 5, 2018.